Glucose is the sugar in blood which serves as an energy source for a horse's body. It is obtained from food when the body processes and breaks down the carbohydrates and nutrients in feed and roughage. Just as humans monitor their own glucose when they have symptoms such as sluggishness or dizziness, sometimes horses need to have their glucose monitored as well. 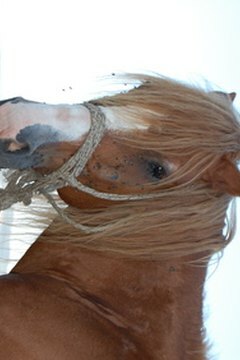 Horses can make glucose in their liver, but it mostly is obtained from feed such as oats, sweet feed and corn. Beet pulp tends to be more natural and less processed than commercial feeds, so commercial feeds are more likely to have more glucose and sugar in them. Glucose is also obtained from roughage--hay and grass--that horses eat constantly throughout the day. The body processes these foods and breaks them down in the digestive system, isolating glucose in the blood. Insulin is the hormone that carries glucose across cell membranes, and is produced in accordance with how much glucose is present in the blood. Therefore, glucose and insulin levels must be balanced with each other. Disorders and health problems occur when glucose and insulin are not working properly together. The pancreas manages this balance. The equine disorder dealing with glucose and insulin is called equine insulin resistance, in which glucose and insulin levels are out of whack with each other. The body does not recognize how much glucose is in the blood, so there is not enough insulin produced to facilitate the transportation of glucose, which is vital for energy. Essentially, cells don't receive enough energy because the insulin is not there to provide the cell with the glucose it needs. An abnormal level of glucose can also perpetuate weight problems, depressed or disinterested mood (due to lethargy) and likelihood of colic. Horses who are suffering from equine insulin resistance will appear lethargic, and may also have abnormal fatty deposits. Their weight may be erratic as well. They could lose weight, or gain weight, and also experience muscle loss and weakness. An insulin resistant horse may be obese, but obesity does not necessarily mean the horse is insulin resistant. Glucose levels are tested with a blood test, so you should arrange a schedule with your vet for how often glucose needs to be checked. Further, the diet should be closely watched and concentrated grains and sweet feeds should be cut. Anything rich in carbohydrates will only perpetuate the problem. There are also supplements available to help with treatment. M.J. Taylor started writing professionally in 2008, working on a blog for an events company. She writes about destination travel and budget travel on various websites. She has a Bachelor of Arts in English.